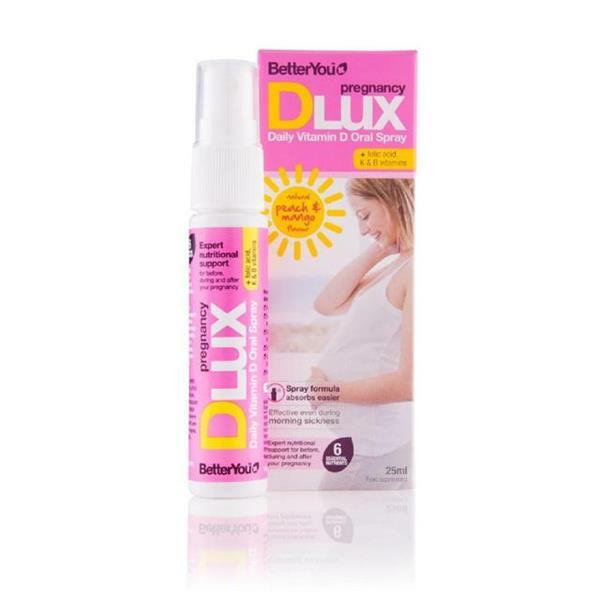 Better You Pregnancy DLUX Daily Vitamin D Oral Spray also contains folic acid and vitamins K and B. This peach and mango flavoured spray contains 1000iu of vitamin D as well as the recommended levels of K, B1, B6 and B12. Vitamin D is used to keep bones and teeth healthy and to maintain a healthy immune system and normal muscle function. The vitamin is in spray form for better absorption into the blood stream and therefore ideal when suffering from morning sickness. Suitable for vegetarians, no artificial colours or flavours. Shake well before use. Spray five times into your mouth or the side of your cheek. No alcohol, gluten, salt, yeast or lactose.